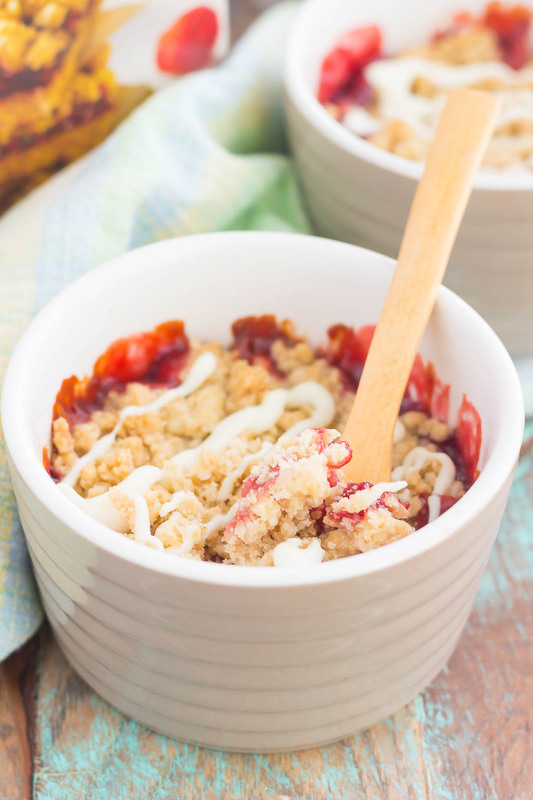 This White Chocolate Raspberry Crumble is packed with a buttery crust that’s topped with a sweet raspberry sauce and luscious white chocolate. Baked in mini ramekins and ready in no time, this easy dessert is perfect to for just about any occasion! Now that we’re heading towards the end of March, I’m really starting to get the itch for spring. Sure, the weather is still cold and dreary here, but with April (and Easter!) right around the corner, I can’t help but think of warmer weather, more sunshine, and longer days ahead of us. Are you excited for spring, too? Not only does the weather (hopefully) get better, but thoughts of more outdoor activities and summer are always on my mind. You know, afternoon walks, sweatshirt weather, the flowers and trees starting to bud, that kind of thing. At least if you live in a colder climate, that is. And after Easter has come and gone, I feel like we’re officially on our way to spring. Know what I mean? And with warm thoughts of spring and Easter come more lighter, colorful foods. I still love those hearty comfort foods, like chili, soups, and casseroles. But I also start to crave more salads, quinoa, and more fruity desserts. It gets me in the mood for the season and for what’s ahead in the upcoming year. 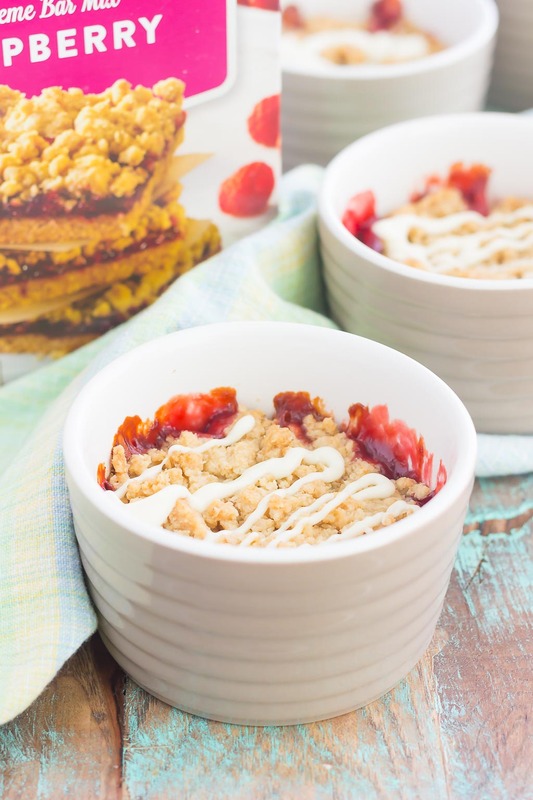 That’s where this White Chocolate Raspberry Crumble comes into play. It’s made with Krusteaz Raspberry Bar Mix. You probably know by now that I’m a huge fan of Krusteaz. They’re my go-to mixes for muffins, pancakes, donuts, and ice cream pies. 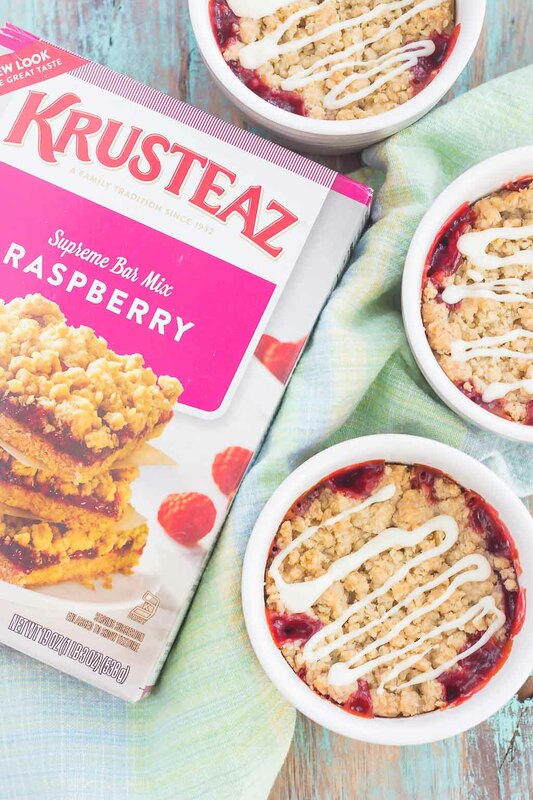 I love that you can use Krusteaz to save time in the kitchen, but still get that quality, homemade taste. And you know me…I love mini anything! I’ll take just about any excuse that I can to bake with mini dishes, ramekins, and skillets. It just seems more fun (and delicious!) to eat. If you’re like me, then fruit crumbles are pretty much the best dessert ever. 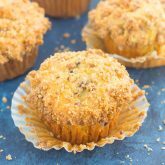 I can never resist the crumbly, streusel topping and sweet fruit that’s nestled inside. And it tastes even better when chocolate is involved! That’s right, on top of the raspberry layer are white chocolate chips, and on top of the crumble is even more white chocolate How delicious does that sound? 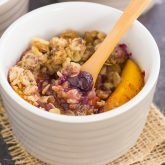 This crumble can easily be made as bars, but I thought it would taste even better served as a warm crumble. And don’t forget about that drizzle of white chocolate! One bite and you’ll be hooked on the buttery crust, raspberry sweetness, and surprise of white chocolate chips hidden inside. 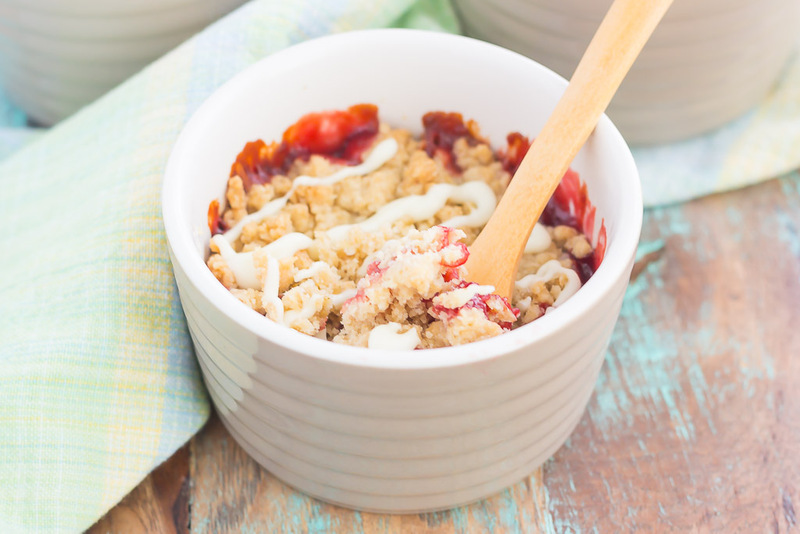 This White Chocolate Raspberry Crumble would be perfect to serve as an indulgently easy dessert! 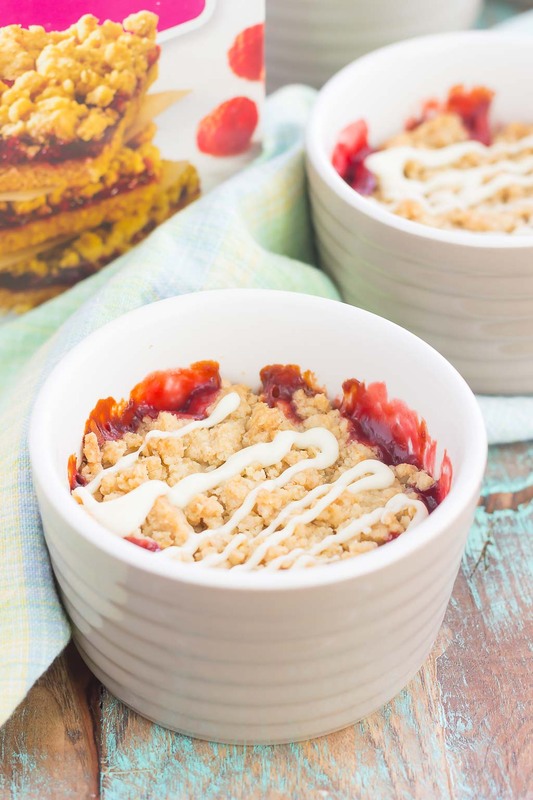 This White Chocolate Raspberry Crumble is packed with a buttery crust that's topped with a sweet raspberry sauce and luscious white chocolate. Baked in mini ramekins and ready in no time, this easy dessert is perfect to for just about any occasion! Thanks, Sarah! White chocolate and raspberries are one of my favorite combos! 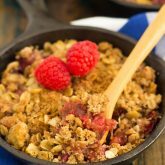 This crumble has me so excited for spring AND especially berry season! It doesn't get much better than a crumble and I love that these are the perfect portion size. That white chocolate drizzle is perfection! Thanks, Mira! Individual portions are the best! You can't beat that crumble topping! 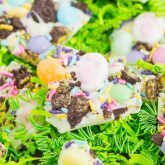 Looks like the perfect easy Spring dessert! !